THOMAS A. DORNIN. 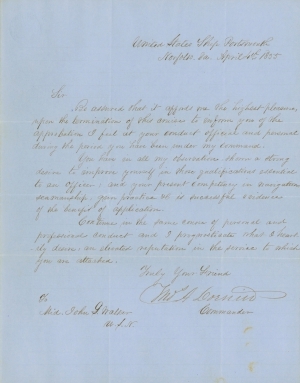 Manuscript Letter Signed, U.S.S. Portsmouth, Norfolk, Virginia, April 4, 1855, to Mid. John Walker, U.S.N. 1 p.
Be assured that it affords me the highest pleasure, upon the termination of this cruise to inform you of the approbation I feel at your conduct official and personal during the period you have been under my command. You have in all my observations shown a strong desire to improve yourself in those qualifications essential to an officer, and your present competency in navigation, seamanship, gun practice &c is successful evidence of the benefit of application. Continue in the same course of personal and professional conduct and I prognosticate that I heart-ily desire, an elevated reputation in the service to which you are attached. Dornin prevented an invasion of Mexican territory by William Walker’s expedition in 1851 and he freed 40 Americans who were chained and double ironed in the hold of a schooner in Mazatlan. Later, off the coast of Africa he captured two slave vessels with over 1,350 slaves onboard, and landed them safely at Liberia. Thomas Aloysius Dornin (ca. 1800-1874), born in Ireland, was appointed as a lieutenant in the United States navy in 1825. He spent several years in the Pacific aboard a sloop-of-war before eventually being appointed to the command of a store ship on the fitting out of the South Sea exploring expedition. While in command of the Shark, in the Pacific, he was commissioned commander (1841) and given charge of the sloop Dale, which he brought home from a cruise in 1843. In 1851 he sailed in command of the Portsmouth, and during his cruise he was ordered to charter one of the Panama steamers and endeavor to prevent the invasion of Mexican territory by William Walker’s expedition. In the execution of this design he was completely successful. After discharging his steamer he visited Mazatlan, where he found forty American citizens, who had been peaceably doing business in Guaymas, closely packed in the hold of a schooner, doubly ironed, and chained to the bottom of the vessel. Captain Dornin at once demanded of the governor their immediate release, and after considerable delay that official finally complied. Dornin then sailed for Acapulco, where he learned that a Mexican war vessel had declared a blockade and driven off U. S. mail steamers. He pursued and overhauled the vessel, and notified her commander that such proceedings were in violation of a special treaty between the United States and Mexico. The Mexicans, after making a written protest, abandoned the blockade. After being commissioned as captain (1855), and while in command of the San Jacinto, Dornin captured two slave vessels on the coast of Africa with over 1,350 slaves on board, and landed them safely in Liberia [the brigantine Storm King, of New York, August 21, 1860; and the brig Bonita, October 10, 1860]. During the civil war he was promoted to the rank of commodore on the retired list (16 July 1862), and at its close was placed in charge of the fifth lighthouse district.